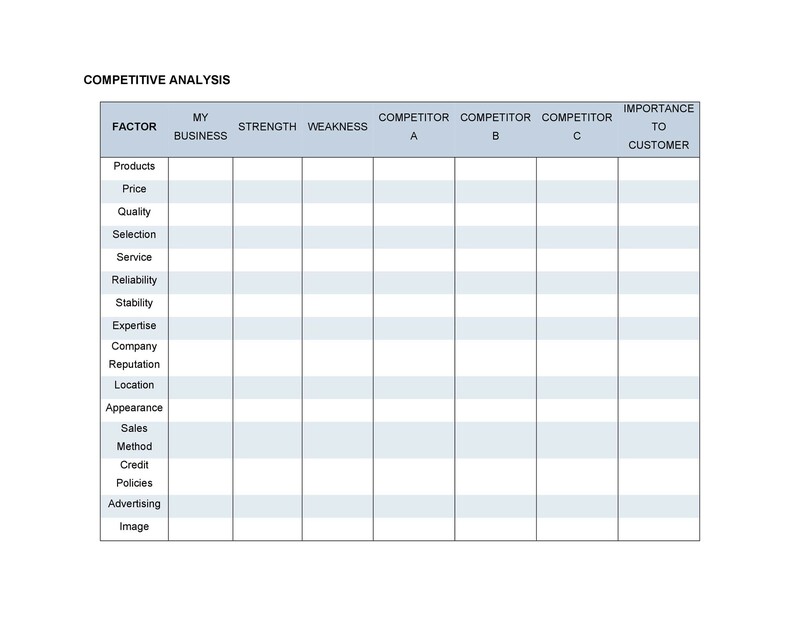 Such analysis will include evaluations on your competitor’s strengths and weaknesses. 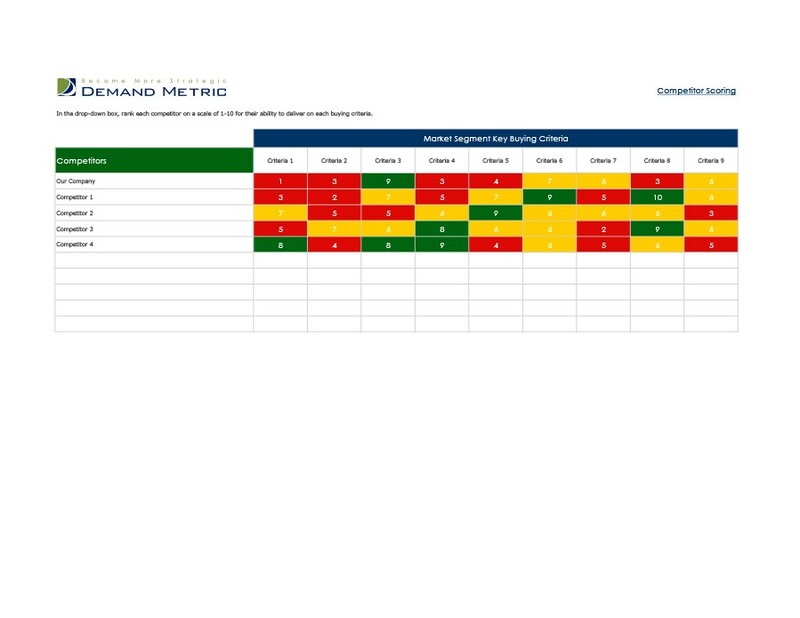 With this data on hand, you can begin to formulate how to give the company an advantage. Innovations to produce such advantage will always result in better products and services. This is a continuing process, it is an integral part of the company’s business or marketing plan and it also provides context for growth. 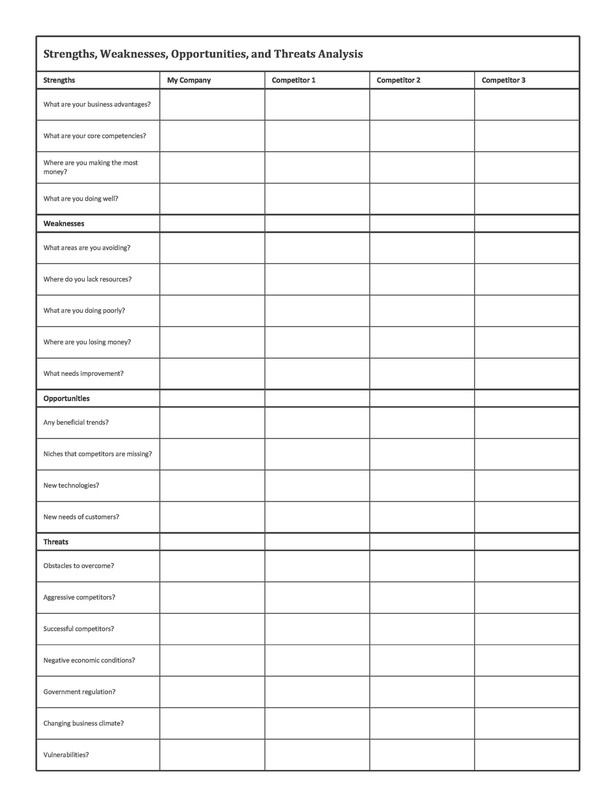 This article is all about this evaluation, from the key elements to the types and even some helpful tips in writing such a document. 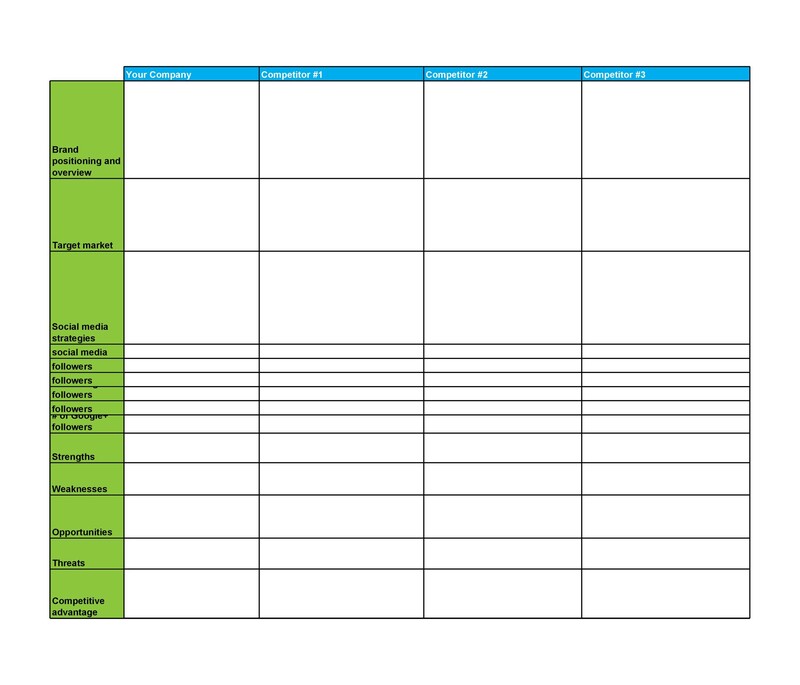 First and foremost is acquiring a list of your competitors. Know your enemies. Gather all available and relevant information about these companies. Rank them by considering who the chief competitors are. Some can indirectly compete with yours, but since they offer the same products and services aiming at the same customer capital, include them in the list as well. Also, include all the information on those planning to enter your market in the near future. 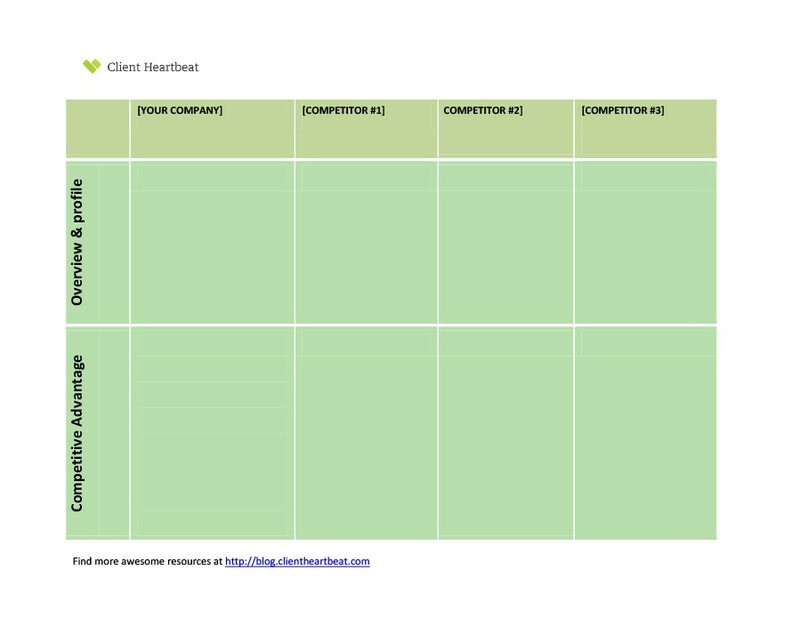 Once you have completed this task, filter those companies that will provide you the greatest challenge. 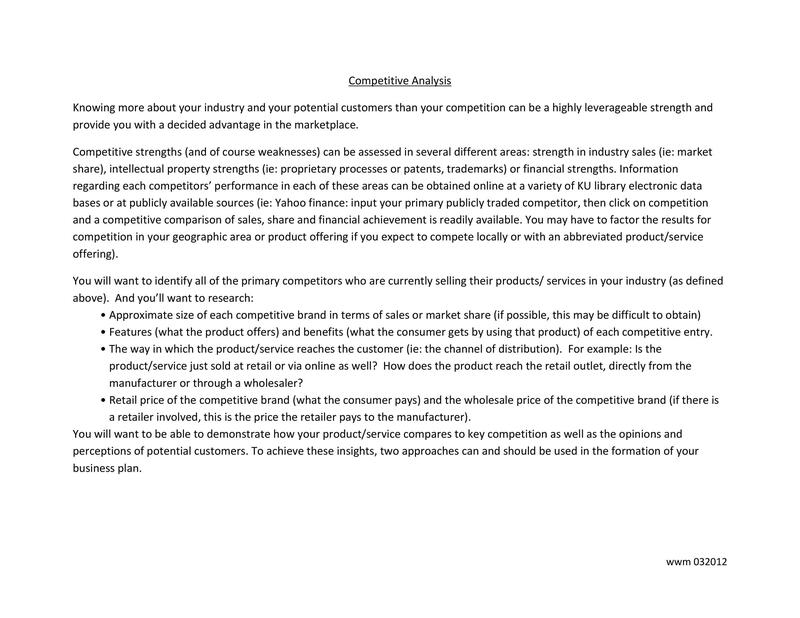 Do research on all information regarding the competition’s products and services, their features, their value, their goals. Find out their sales strategies. A customer survey conducted by the trade press is valuable aids in finding out customer satisfaction about competitors. Also, ask your own sales force for the same info. Since they are directly involved with customers, they could be the best source of information about your competition. 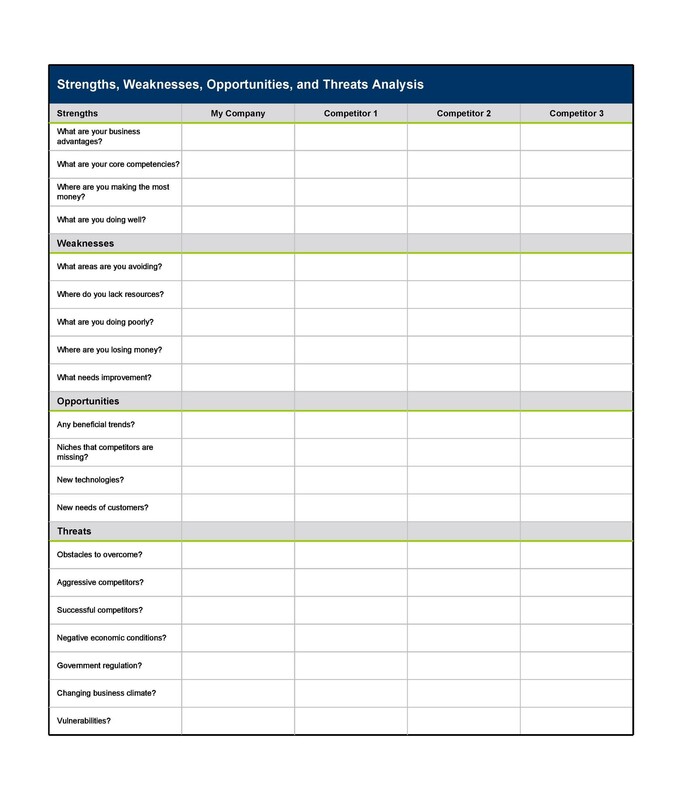 Be objective in assessing the strength and weakness of your competitor’s product. Assume the position of being the competition. Ash questions: why are they more successful in their sales, why do customers prefer their products, what are the factors that cause rapid growth in their company? Observe your competitors marketing strategies. Press releases and advertising can play an important part of their success. Also, access quarterly and annual reports on the competitor’s progress as these would provide a great deal of information about their strength/weaknesses. Interviews with journalists and consultants can be valuable. Also take into account the competitor’s customers. Great sales people can pinpoint who they are and can help you get further information. All these sources will involve hard footwork for completing the final picture of the competitions strengths and weaknesses. Always remember that the goal is to nail your competitor down. This will involve the present status of the company with regards to success in cornering the market. 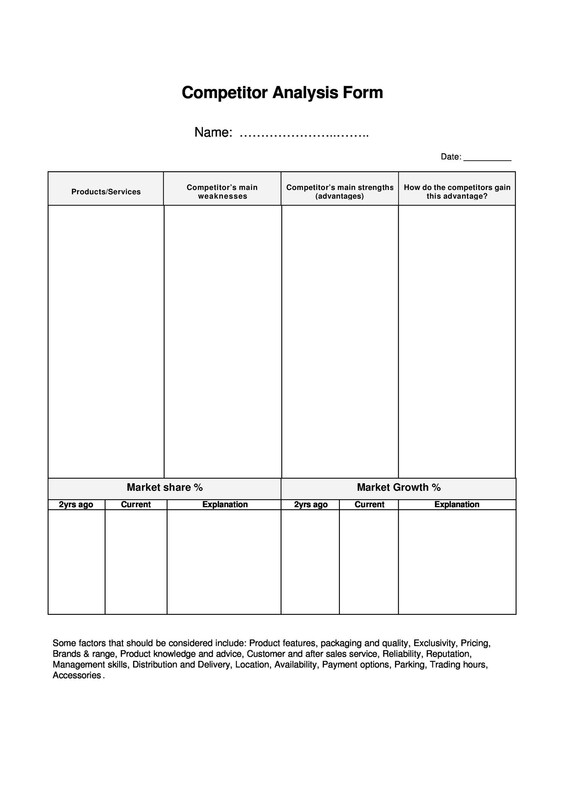 How is your product doing? Is the market growing? If so, then it’s great. Innovate to further its growth. If not or if the market is flat, then the competition for the market must be fierce. All companies must be scrambling to get a share of the market. This outlook portion of your analysis is really a measure of trends. After you have done your researches, you will have enough information to determine what the outlook really is. 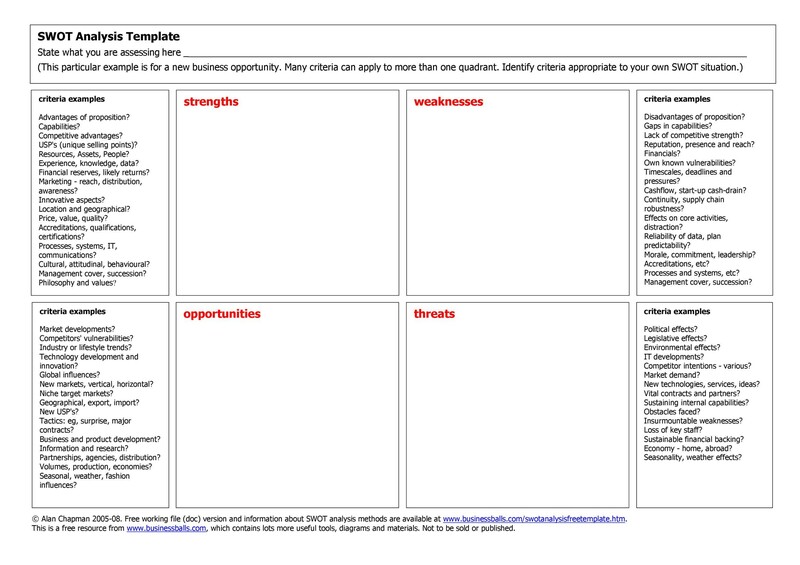 This analysis will serve later on as a valuable source of information for your company and your clients. 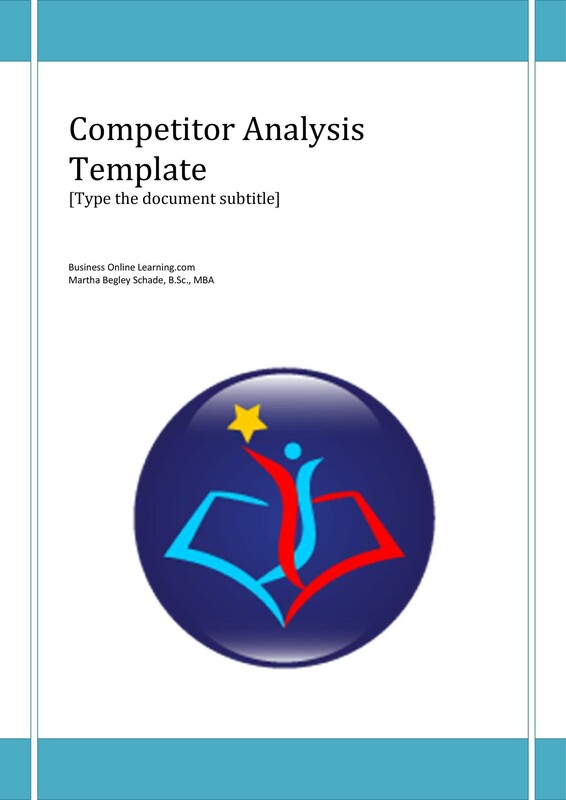 Writing a template for your Competitive Analysis will provide for your company information on the workings of your competitors, starting with their identifications, products, strengths and weaknesses. 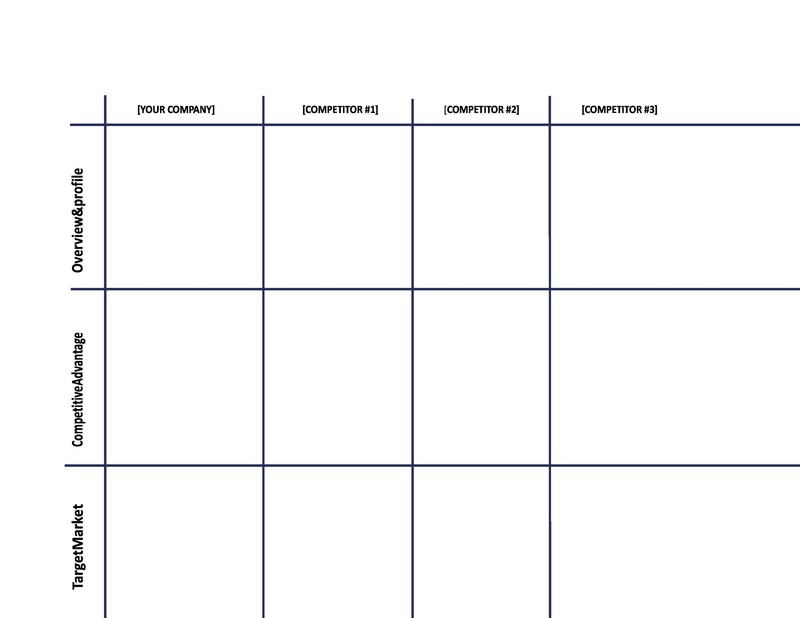 From these, your company will be able to develop marketing strategies to top the successes of the competition. 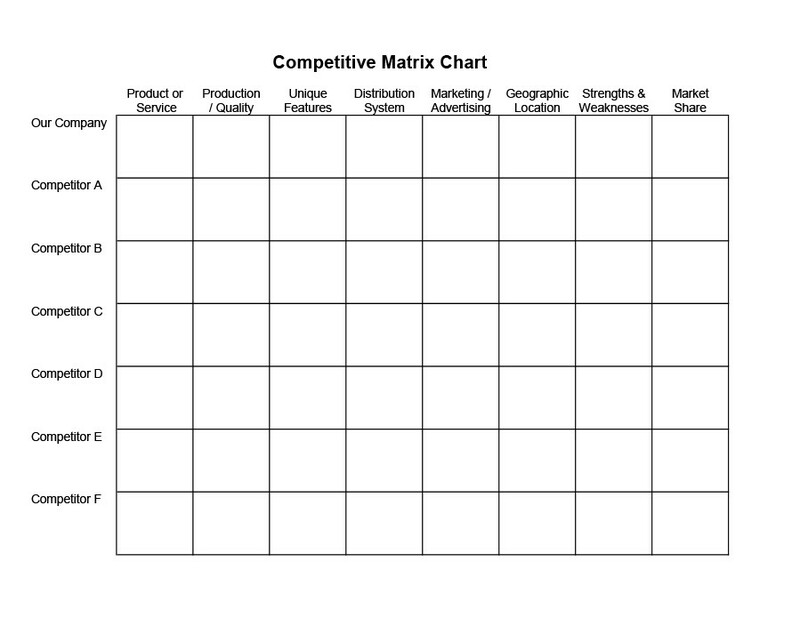 Identify the points where the competition is doing extremely well. Ask why they are performing well, what are they known for, what area in the business are they more superior to yours. Maybe they are better in the following fields: their pricing structures, their inventory selection, their level of customer service and more. Research on how it compares with yours. This time, ask why the competition falls short with respect to your company, why do they struggle to be competitive against you. From your perspective, these should offer you opportunities that you should explore so as to win some more of their customer base. What are the Marketing Strategies? There are a lot of marketing strategies being applied by companies to increase their customer base. Research will direct you to those that are worth emulating and through innovation, you can do even better. Don’t be afraid to inject new ideas to improve already working strategies. What are the Financial Resources? Do research works on your competitor’s financial reserves whether they are struggling or on solid footing. 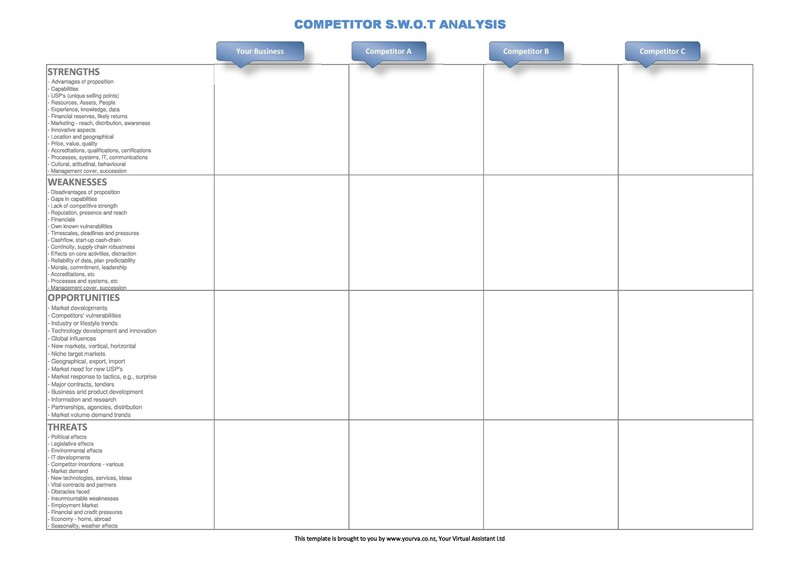 What best way to have an overview of your competition’s operations. 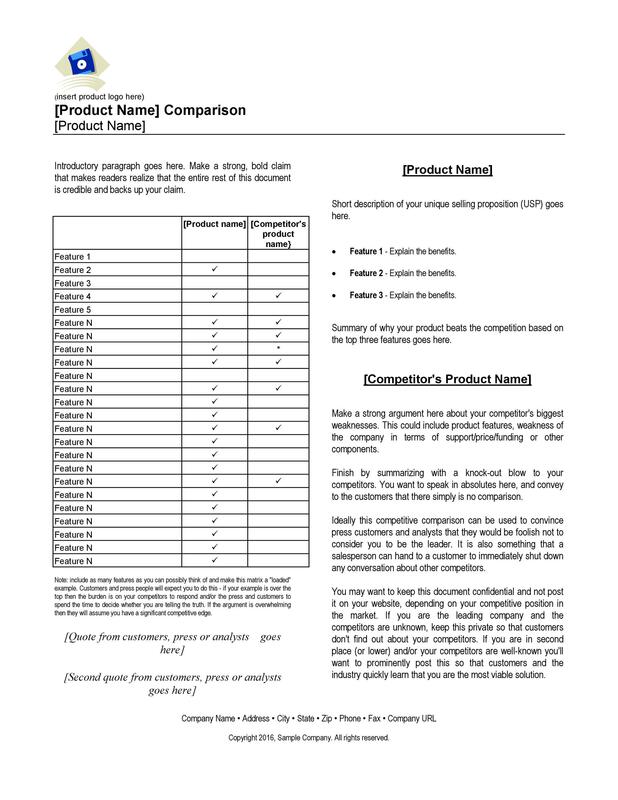 Simply type in the competitor’s name and presto, you are offered different kinds of articles and reports about them. You may even be presented with legal findings or some old news that could shed light on how their business operates. 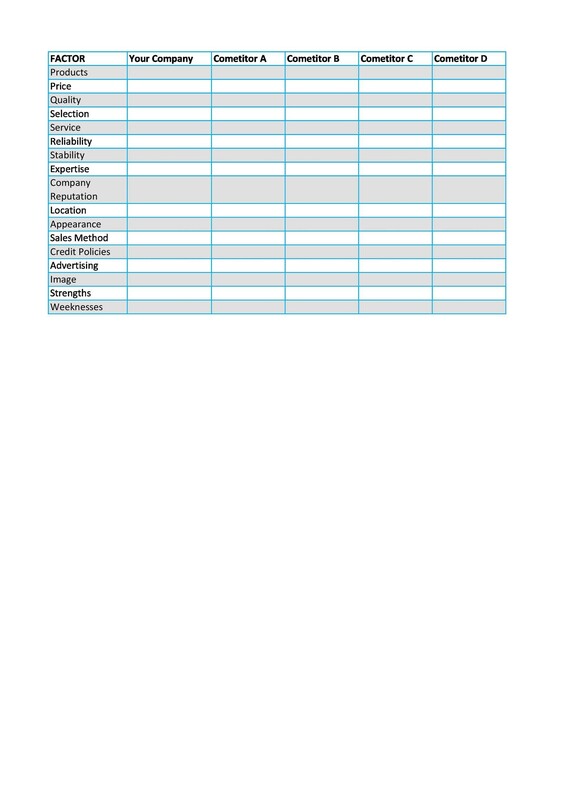 For more detailed information about your competitor, visit their website. Driven by menus, you can easily find out almost everything about your rival: what they have in stock, their work force, their marketing strategies and maybe even their earnings. Access your competitor’s marketing tools either by registering at their website or requesting information through their site’s help application or taking note of local ads. Information about local companies can also be accessed through local newspapers. Data like job openings, performance awards or maybe some expansion plans. Gathering data have great advantages. Information acquired could be used to improve your companies marketing strategies. 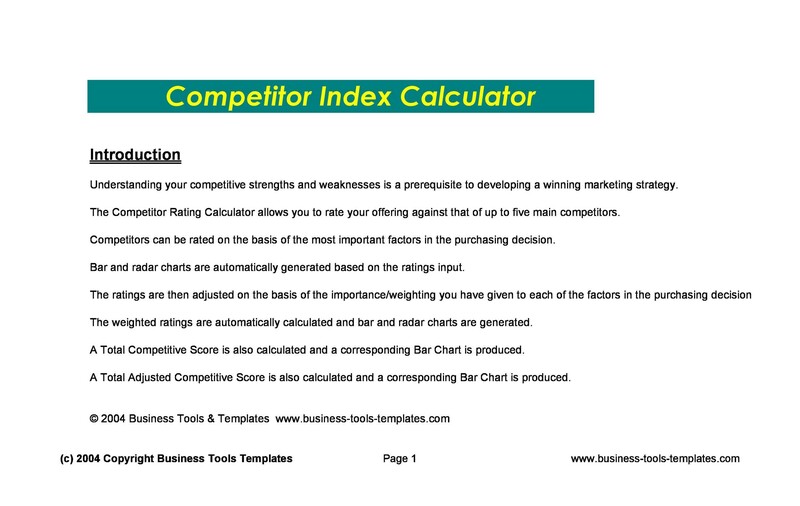 The source for this information is vast and can enable you to better understand your competition’s operations and at the same time improving yours. 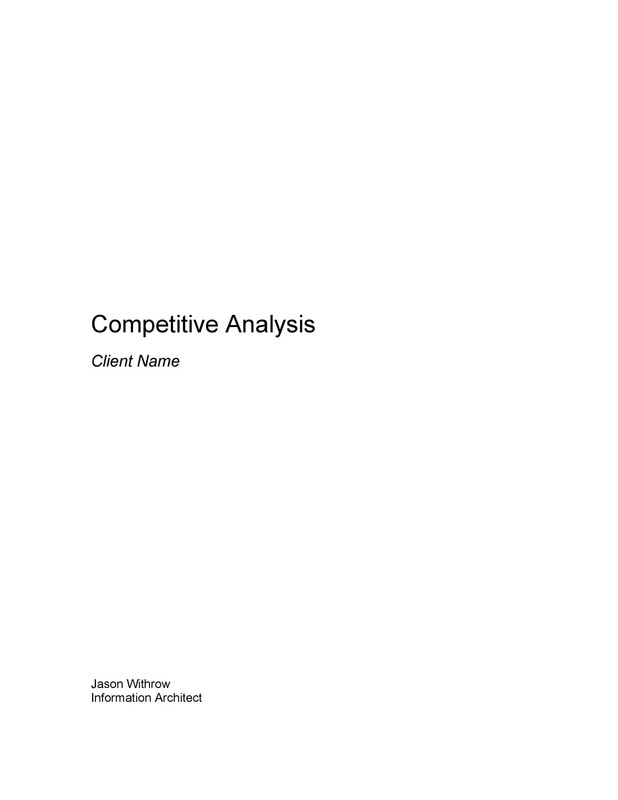 For markets that only involve a handful of a competitor, it would be best to develop an analysis for each competition. The steel industry and the automotive industry fall under this category. However, if you are selling in a market where there are many competitors, your job in analyzing the competition becomes more complicated. It will not be practical to maintain information on dozens of competitors. Save yourself valuable time by applying the 80/20 rule. In markets with plenty of competition, it is most likely that 80% of the total market revenues are accounted for only by 20% of the competition. It is the 20% that you should concentrate your efforts on, these are your chief competitors. 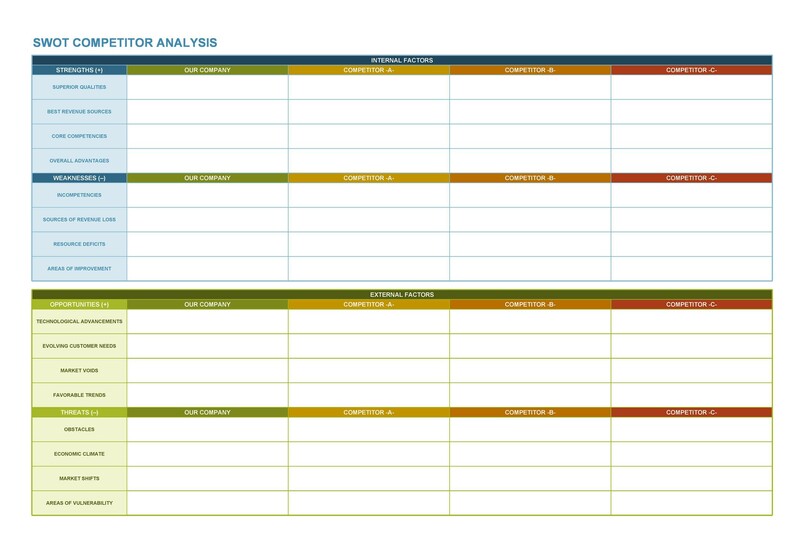 Concentrate your analysis on this group, study their marketing strategies, find out their strengths and weaknesses. 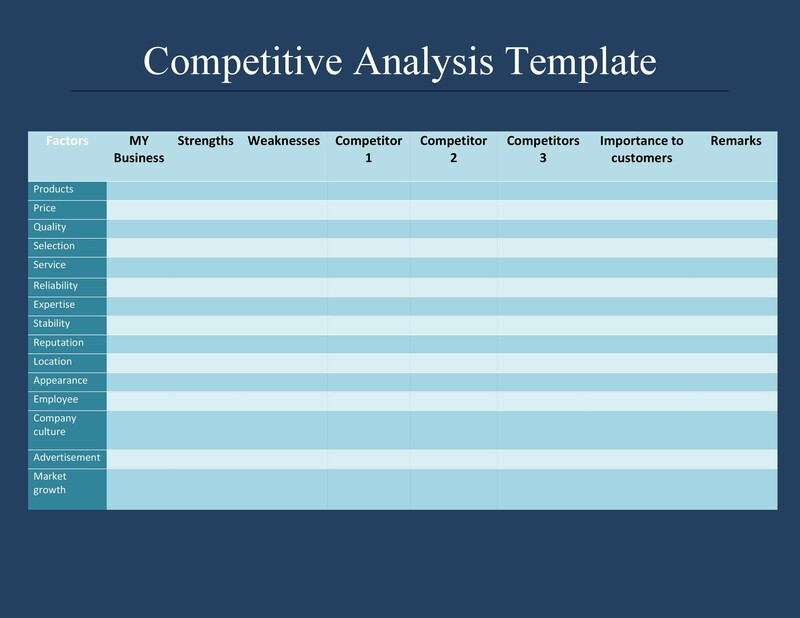 Your competitive analysis should at the least yield positive results for your business. You must always be aware of new and upcoming players who could become dominant players through some variable, whether it is a new technology or an aggressive advertising campaign. 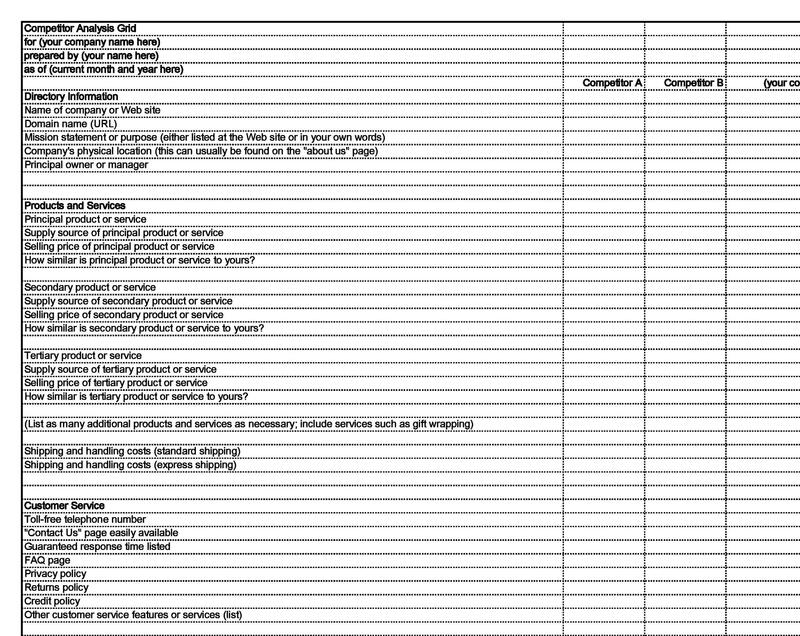 Businesses that sell substitute products and services or items that can be used in place of yours. If you own a bakery, an indirect competitor will be a restaurant. Or owning a picture frame shop, an indirect competitor will be a craft store. The company should be aware of the entry of new business establishments offering the same products and service. 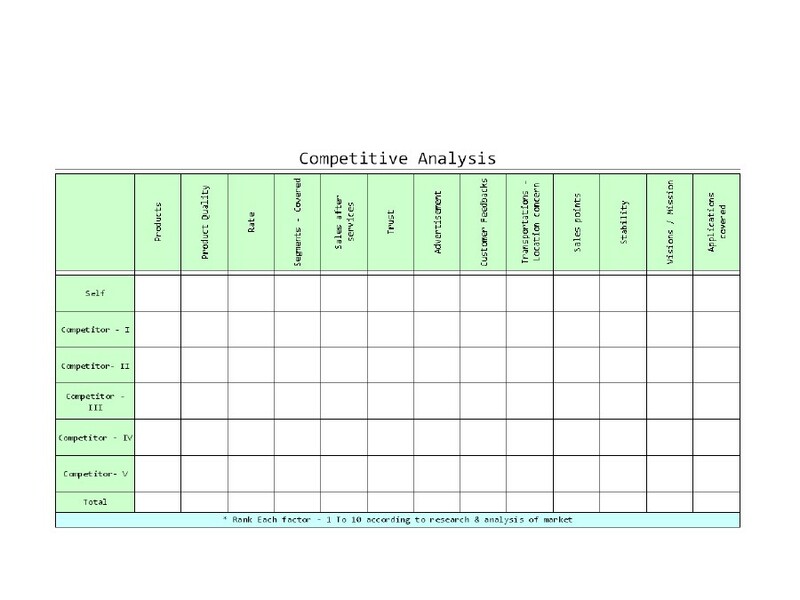 This will result in further analysis of your current and future competition. 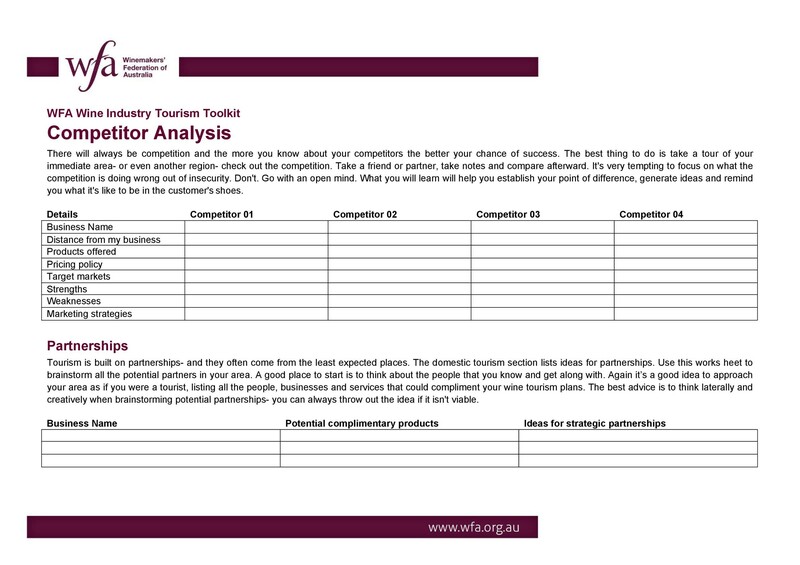 You should research for information on the different types of competitors while you make your competitor Analysis. 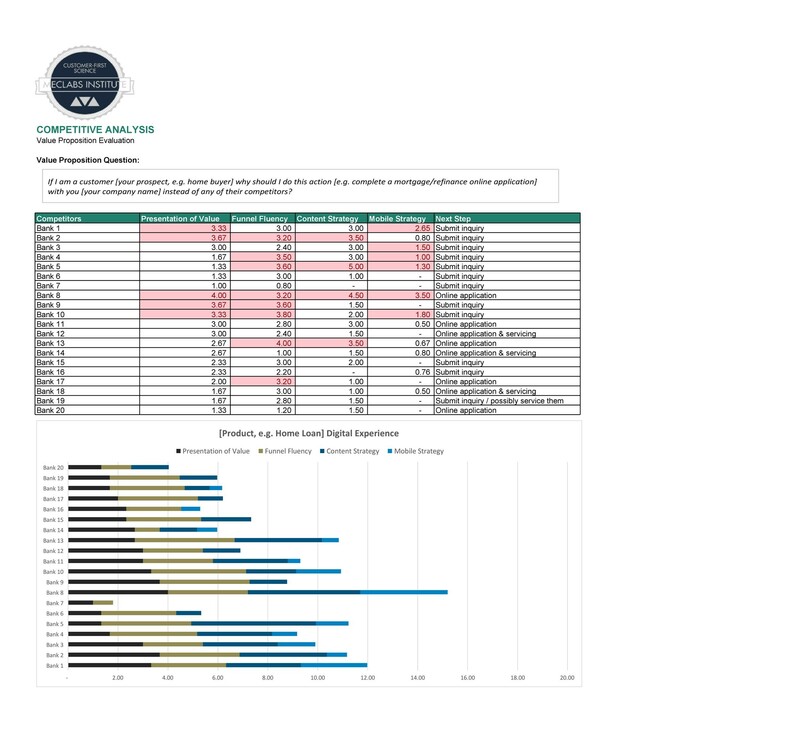 Determine if the businesses are direct, indirect or potential new entrants. 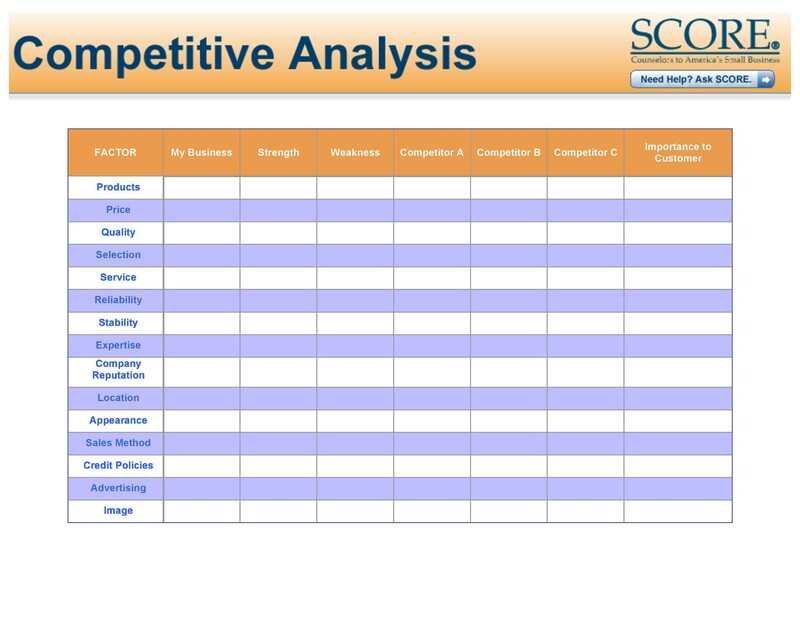 Each type will define what competitive analysis you will make. 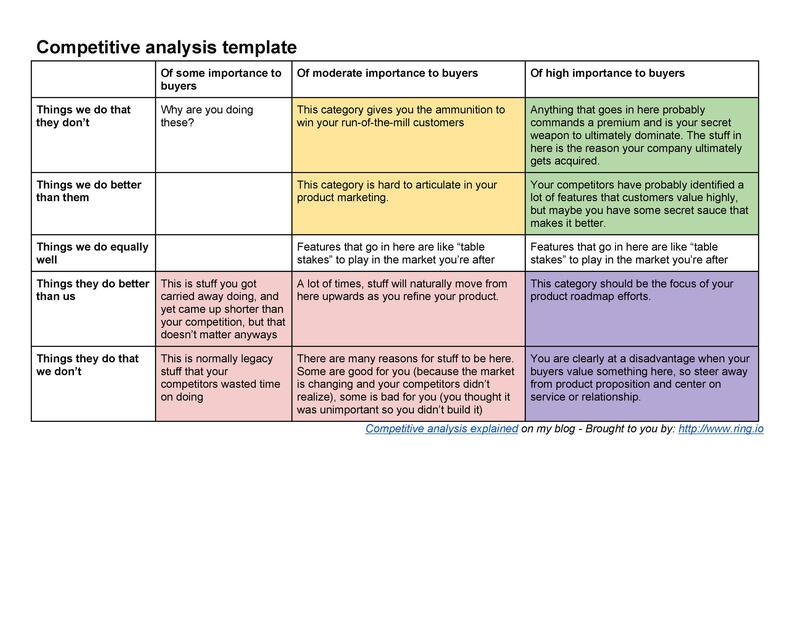 The importance of making a competitive analysis template becomes even more evident as the business grows. The application of the analysis is conducted not only at product levels but also on strategic unit levels or even at company levels. 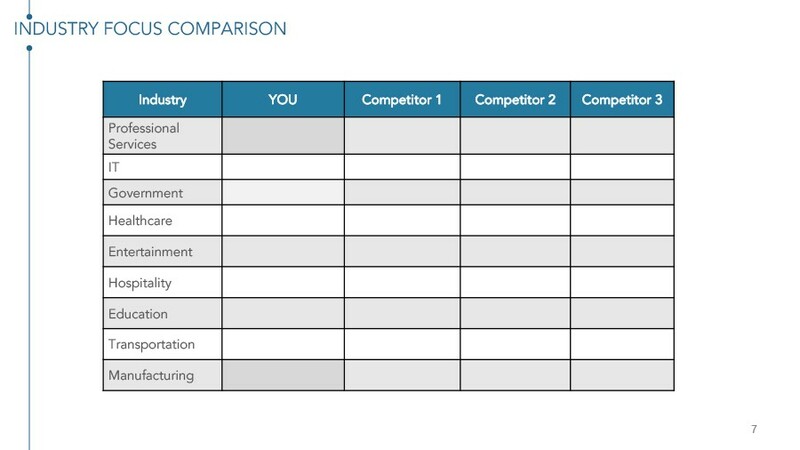 Where you are strong against the competitors and what are your advantages? Where is the competitor strong and what are his advantages? Where is he unbeatable? These two points will make you well aware of your position in the market at anytime. Through years of dealing with your competitors, you get an insight on how they make their decisions. Forecasting their moves based on the past would prove advantageous. Through research, you would have information on your competitor’s resources and their capabilities that would further strengthen your resolve on decisions you will be making. But you have to apply your forecast immediately. Remember that you are dealing with the same guy and may also have formed a forecast against you. It’s a matter of who beats who to the draw. This is a tedious stage in your business because whatever strategy you take, such will be based on a hundred decisions. It also would involve a lot of money and time which cannot be easily recovered. But there are no other options if you want the company to progress, to move up. Therefore, the ultimate objective of the competitive analysis is to be able to choose the right strategy to move the company forward. The first stage is to analyze your competition and do a comparative analysis. 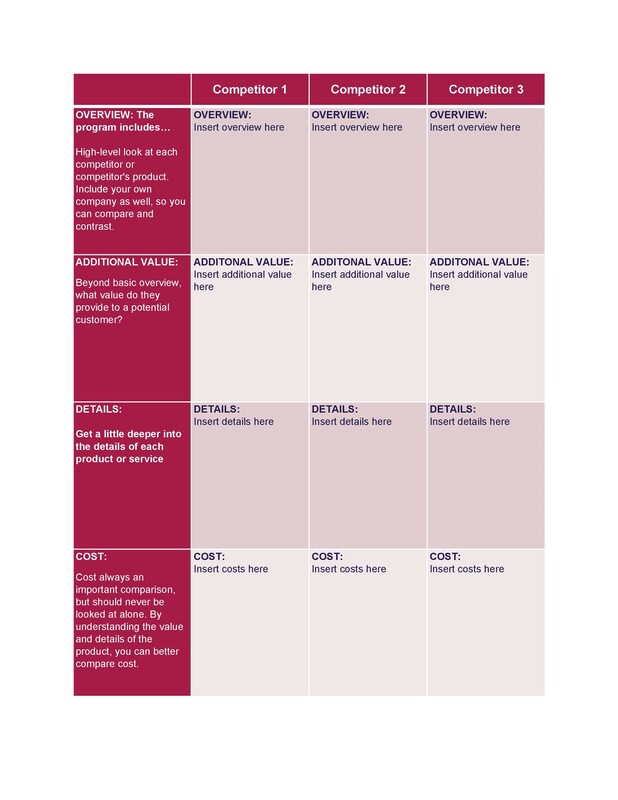 The second stage is involved in making forecasts on your competition’s decisions. 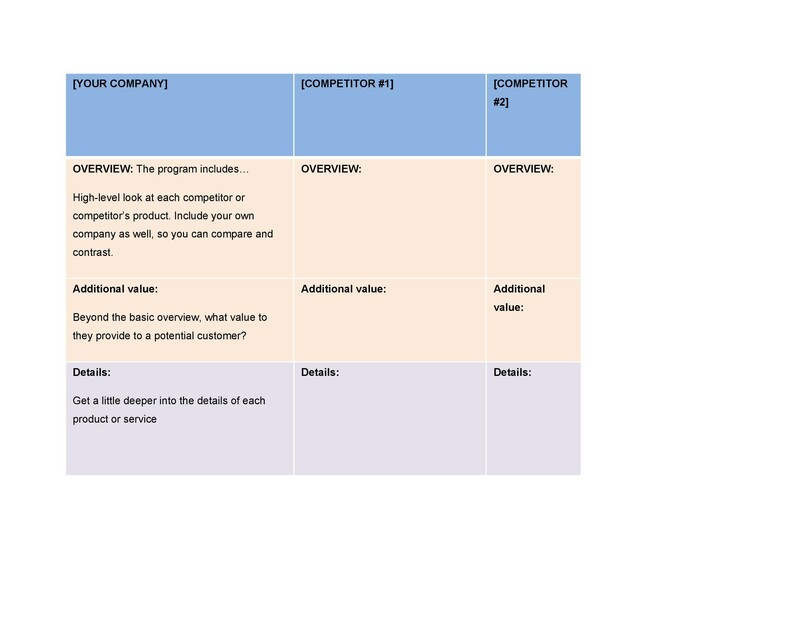 In this third and last stage and based on the first two stages, you can now make a decision on what strategy to implement in order to capture the market share of your competition or expand your product to new horizons. 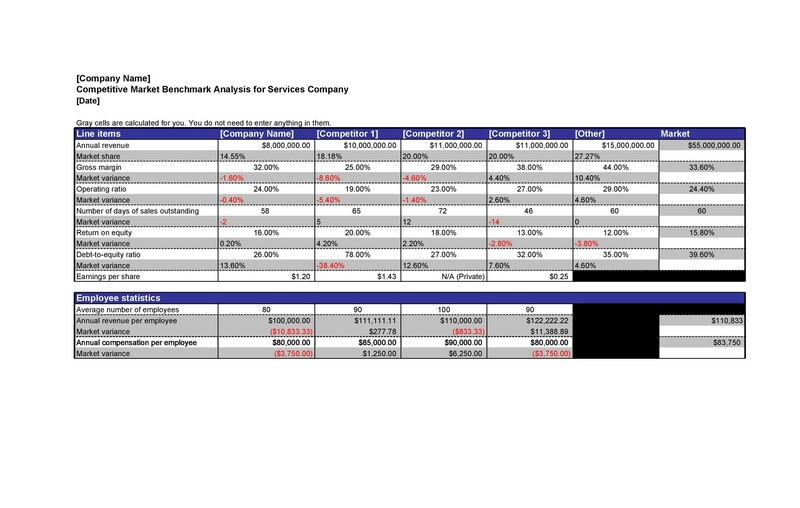 As you can see, making such an analysis is really beneficial to your company. 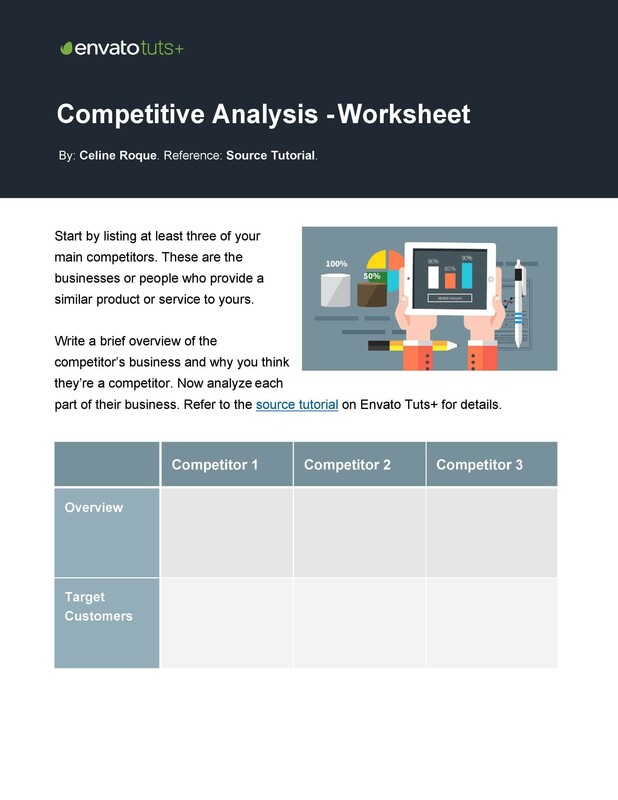 So now let’s move on to some tips which can guide you as you are writing a competitive analysis or a competitor analysis. Visit competing establishments as a customer. Communicate with these companies through telephone or better yet, the internet. Observe how they respond to your queries. It will reveal a lot about your competition, some good (which you can later adapt for your business) and some bad (which should be avoided). Involve yourself in this experiment, buy something or engage their services. You’ll be getting hands-on knowledge on how the company deals with you. 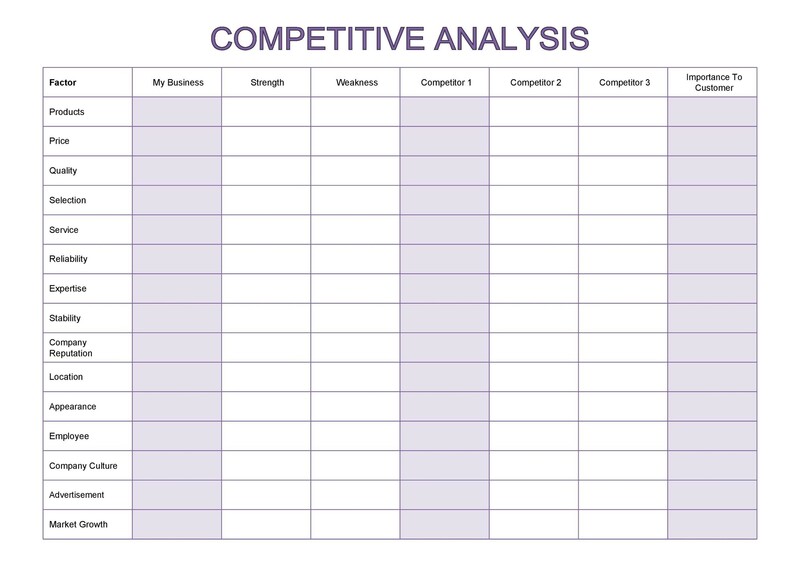 The best way to measure the capabilities of your competition is by appropriating some time to investigate your competitor’s personnel. Could you do this face-to-face? if yes, better. Otherwise, the internet, newspapers, people outside that company will also be an effective substitute. Questions related to educational backgrounds, work experiences, tenures of office residency, their strength, and weaknesses, their reputations. You can think of other queries which can help you anticipate your competitor’s moves. This is s good tip. In buying even a few stocks in your competitor’s company entitles to receive regular updates on the firm’s financial results and business strategies, as well as information about the firm’s future plans. There is no unethical move here. After all, having stocks in the firm makes you an owner even to a minuscule degree. In the meantime, you will obtain valuable information where you would most likely face direct competition. You can conduct surveys or polls of your competitor’s clients. Ask them questions like: How did they originally choose where to spend their money? Why do they choose to buy from your competitors? Is it the quality of the product/service, the price, the location, the customer support or is it just plain habit?You can go further by asking what they dislike about other companies, what they wish the company would provide, would they consider buying from you. If not, why? If they would, what incentive might win them over? The internet these days is the best source in retrieving information. 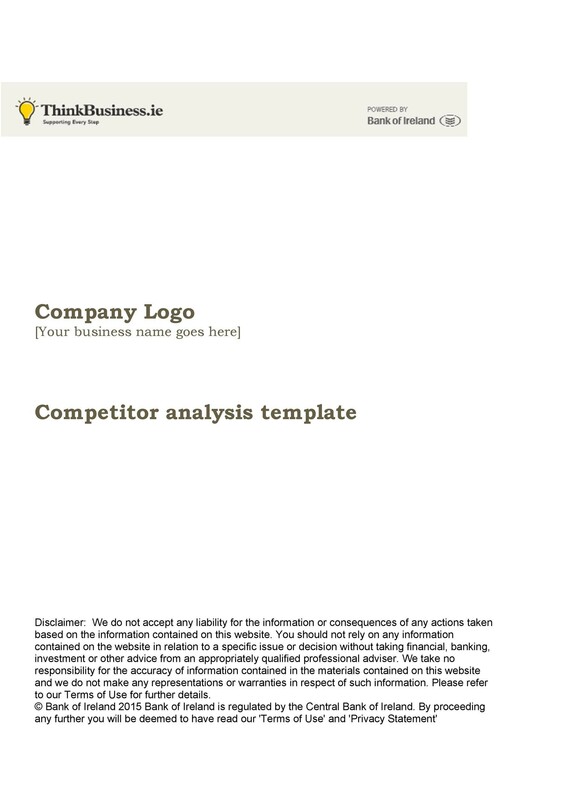 Some online services can provide you literature about your competitors, especially if they are large companies. Most searches are free. Some require fees for requested articles usually as monthly subscriptions. Visit your competitor’s websites. Mostly all the data you need is there. Social media is another way to gather information. Sign up for their blogs, “like” their FB page. You will discover how they’re using the internet to reach their customers. 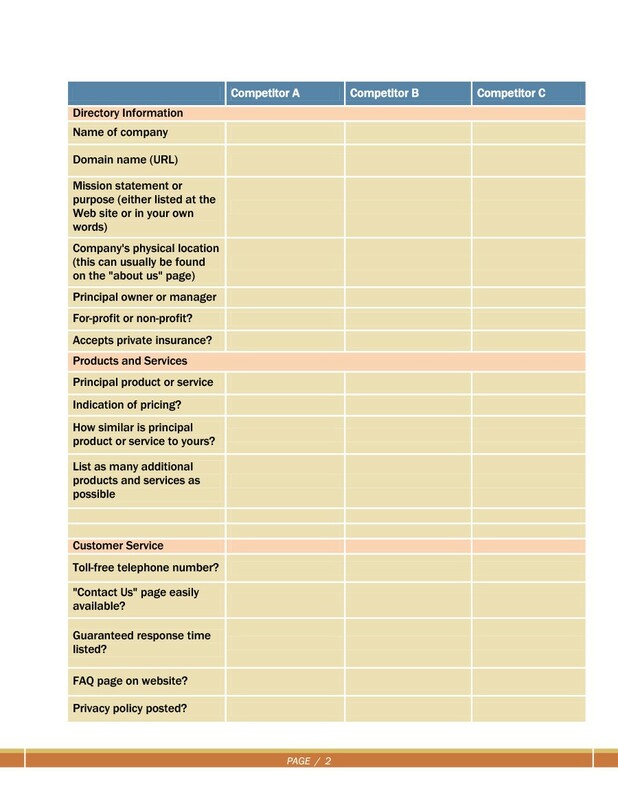 The nature of many businesses requires them to disclose information to government agencies. These are required to undertake public offerings, receive building permits, and register patents, trademarks and more. Many of these filings are public records and can readily be accessed for references. Information about the company’s goals, strategies and technologies could all be contained in these filings. This should be a treasure cove when searching for information on your competitors. No better source of information than your local librarian. Getting friendly with them could save you time when researching about your competitor’s dossier. They are truly adept, especially in local publications. Newspaper clippings on your competitor’s activities could easily be obtained by your friendly local librarian. There are also specially trained business librarians who can provide you assistance in market research. On a larger scale, attending conferences and trade shows is one of the best ways to get to know your competition better. Their representatives will be out there bragging about their company’s products and/or services. Take advantage of this opportunity to familiarize yourself with their offerings: the way they present themselves, what products they are focusing on, what products they are not advertising, what new products they are pushing and more. All the answers are in conferences and trade shows and without them knowing that you are the competition. Observe the tactics your competitors apply. They are a good indication of their goals. The usual tactics include: lowering prices to increase its market share, the firm attempting to increase profits by cutting cost, a business wanting to accelerate sales growth by kicking off a major marketing campaign. If you knew your competitor’s goals, you could also better anticipate and respond to their strategies. You can never tell when another company will gain entry which will try to meet the need your business is trying to meet… at the same time. You need to be ever vigilant and alert to other companies stealing your business and preventing your company from thriving.